How do you feel about the idea of roasted sweet potatoes for breakfast? Does it seem strange to you? I have to admit, I thought it was kind of wacky myself. But then a couple years ago, on a desperately cold morning with no semblance of real food in sight, I re-heated a leftover sweet potato, topped it with whatever yogurt, fruit and granola I had on hand and just like that, my life changed forever. Now, roasted sweet potatoes for breakfast are a regular (and purposeful!) thing around my house. These Breakfast Sweet Potatoes with Quinoa Granola are a great way to start your day. They are really satisfying. And so easily customizable as well. This version with vanilla yogurt, sliced bananas and homemade quinoa granola is currently my favorite combination. But you can try other flavors of yogurt, mixed berries, chopped nuts and even a few chocolate chips if you’re so inclined! 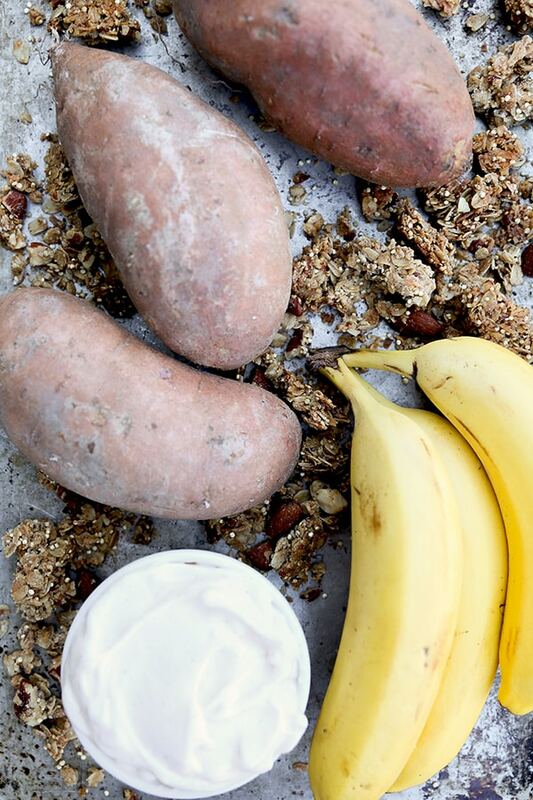 It’s just like making a yogurt breakfast parfait, except that we’re using a roasted sweet potato as an edible bowl! These Breakfast Sweet Potatoes with Quinoa Granola do take more time to prepare than a simple bowl of oatmeal or cereal. But there are a couple ways to streamline the process so you can enjoy this comforting breakfast even on the busiest of weekday mornings. I usually like to prepare the quinoa granola over the weekend, so it’s ready to be used for breakfast (and snacking!) during the week at a moments notice. And I will often roast up a couple sweet potatoes on Sunday night as well, then simply re-warm them individually in the mornings. I find it’s definitely worth putting the time in on the weekend to ensure that I have a healthy and filling breakfast during the week! 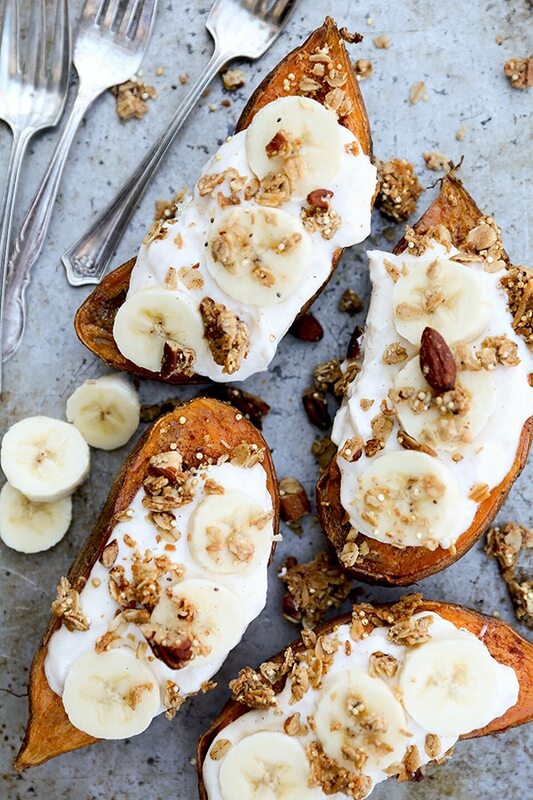 Roasted sweet potatoes topped with yogurt, homemade quinoa granola and sliced bananas make for a satisfying and filling breakfast. Preheat your oven to 300°F. Spray a large rimmed baking sheet with non-stick cooking spray and set it aside. Add 1 cup of the oats to your food processor with the blade attachment. Process until the oats are ground into a flour. Transfer the oat flour to a large bowl. Stir in the remaining unprocessed oats, shredded coconut, quinoa, almonds, pecans, chia seeds, cinnamon, cardamom and salt. Set aside. In a separate bowl, mix together the maple syrup, melted coconut oil and vanilla extract. Then pour this mixture over the dry ingredients, stirring until the dry ingredients are moistened and well coated. Transfer the granola to your prepared baking sheet and press it down firmly to flatten it out into an even layer. Bake the granola in your preheated oven for 40 minutes. It should be lightly browned around the edges and smell fragrant when it’s done. Allow the granola to cool completely on the baking sheet. Once cooled, break the granola up into clusters and transfer to an airtight container for storage. This recipe makes approximately 6 cups of granola. It can be stored for up to 2 weeks at room temperature. Preheat your oven to 400°F. Line a rimmed baking sheet with aluminum foil and set it aside. Rub the olive oil over all sides of the sweet potatoes. Then place them cut side down on your baking sheet. Roast for 25 minutes. The sweet potatoes should be soft and easily pierced with a small knife. Carefully flip the sweet potatoes over so the cut side is facing up. Drizzle 1/2 teaspoon of maple syrup over each sweet potato half. Then sprinkle each half with some of the cinnamon and cardamom. Return the sweet potatoes to the oven for an additional 5 minutes. Remove the sweet potatoes from the oven and allow them to cool slightly. Then top them with yogurt, a few slices of banana and some of the quinoa granola. Serve warm. OMG, why have I never made sweet tatos for breakfast! It makes so much sense! This is so going on my to-make list! I know you’ll love it, Tori! I’m currently eating one of these for my breakfast, and it is delicious! What a fun new way to eat breakfast. And after an intense workout, I’m sure this will keep me full until lunch time. Thank you! Yay! So glad you love them, Gabrielle. That’s great to hear! Do you think you could freeze the granola to pull out later? Hi Amy! I haven’t tried freezing this granola, so I can’t say for certain. If you try it, please let me know how it turns out. Hello! Is there an alternative to using oats? My stomach doesn’t tolerate them. Hi Georgina. Personally I have never made granola without oats, so I can’t offer you any advice. Have you tried searching online for oat-free recipes?